The latest issue of the Automotive News Europe monthly magazine goes live on Monday, November 6. 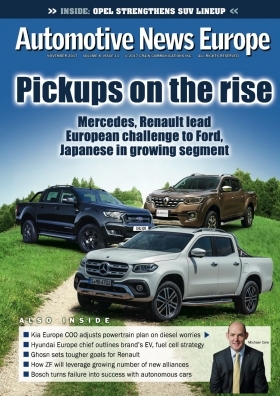 The new edition looks at why the European pickup market is set to take off. Given the vehicles Europeans typically drive, pickups should be too large, too thirsty and too unrefined to gain any traction in the region. Nevertheless, Renault, Fiat and Mercedes-Benz are launching midsize pickups to take on current market leader Ford in a sector that has been traditionally dominated by Japanese automakers. Our cover story analyzes the future of the sector. Volker Mornhinweg, head of Mercedes-Benz Vans, tells us why the German premium automaker decided to do something that was previously unthinkable -- enter the pickup sector. We learned that the motivation was something very dramatic. We also review two of the models that are causing such a shake-up in Europe’s pickup segment: the freshly launched Renault Alaskan and Mercedes X class. These new entries have a very different market positioning, despite both being based on the Nissan Navara and both being built for Europe at Nissan’s plant in Barcelona, Spain. From pickups to sports cars, Porsche finance chief Lutz Meschke says that the company has no intention of reducing its 15 percent operating margin profitability target despite the heavy investments needed to electrify the brand’s powertrains. Kia’s European sales have risen nearly 30 percent since Michael Cole took over as the brand’s chief operating officer in late 2012, but he is keeping a close eye on falling sales of diesels in Europe, where he says the “demonization” of the powertrain has affected consumer confidence. Hyundai’s answer to the diesel demise is a big electrification of its European lineup. Along with battery-powered models and plug-in hybrids, the automaker’s product offensive will include an additional twist: fuel cell vehicles, Chief Operating Officer Thomas Schmid told us. BMW’s i subbrand gets a third model, the i8 Roadster, which will join the i8 plug-in hybrid sports coupe and i3 battery-powered compact hatchback when it goes on sale next spring. The i8 roadster will be one of the key unveilings at next month’s Los Angeles auto show. Renault raised midterm sales and earnings targets as part of the automaker’s plan to protect its leadership in battery-powered autos and keep pace with rivals in driverless models. We look at the key features of the French automaker’s new Drive the Future strategy. SUVs are on pace to become the No. 1 body style in Europe. New SUVs from Volvo, Audi and Mercedes-Benz are boosting European sales well above those of premium midsize sedans and wagons. Opel expects its Grandland X to give the automaker a strong foothold in Europe’s rising compact SUV segment where its poor-performing predecessor, the Antara, failed. The Grandland X uses technology from Opel’s new parent, PSA Group, including its platform and engines. The SUV is built alongside its sibling, the Peugeot 3008, in Sochaux, France, and is the first Opel produced in a PSA plant. ZF Friedrichshafen has spent the year aggressively adding expertise to help it capitalize on the move toward autonomous driving. ZF Board Member Peter Lake explained the advantages of partnerships over doing everything in-house. In the past, failure was taboo at Robert Bosch. However, there has been a big shift in mindset at the world’s largest supplier since Gerhard Steiger took over as the head of chassis systems five years ago. When it comes to finding groundbreaking solutions that will benefit the forthcoming wave of fully autonomous vehicles, failure is encouraged -- as long as it happens quickly and it provides a valuable lesson. Volvo seems to have found a new way to get its vehicles into the hands of customers that is digital, transparent and hassle free without being too displeasing for the dealer. In our Final Word column, we analyze the automaker’s new Care by Volvo program. Described as a subscription service, the offer mirrors what mobile phone companies do to win customers in a highly competitive market.